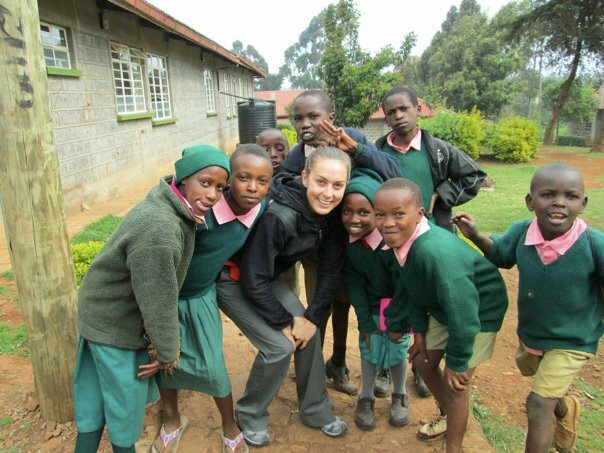 While I was participating in Yoga Teacher Training in 2012, I was invited to be a volunteer/researcher on a trip to Kenya with a nonprofit organized of faculty and staff from DePaul University. At the time, I was wrapping up my first year of graduate school at DePaul and I was absolutely in love with yoga. I became passionate about international, nonprofit organizations after studying abroad in Cape Town, South Africa in 2010. In Cape Town, I volunteered through a U.S. nonprofit at an orphanage in the township of Khayelitsha. My experience in Cape Town left me with many unanswered questions about U.S. nonprofits operating internationally and I was excited to have an opportunity to personally seek some answers in Kenya. Upon arrival to Kenya, the culture shock I experienced stunned me. In preparation for our trip, I focused all of my energy on my research instead of preparing for the journey itself, which was equally as important because of my dual role as a researcher and a volunteer in a third world country. I naively thought I would be “okay” with volunteering in Kenya since I had spent time in South Africa, I did not consider how the people and the environment would impact me emotionally. Once we arrived, my overwhelming emotion turned to panic. At one of our sites, there was extreme, abject poverty. The community lacked all basic resources: food, water, sanitation, and proper education. I will never forget that deep sensation of fear, how uncomfortable I felt the moment we arrived to Athi River. There was an animal carcass, dripping in blood, swarmed by flies, hanging in the front window of our hotel; they butchered the meat there. My room was tucked in the far back corner of the building. There were dried, dead mosquitos on my wall and a net covering my bed. As I stood mortified in my hotel-room, I was most pained by the fact that I knew my accommodations were significantly better than the majority of peoples’ living arrangements in the local community. I felt guilty for being so uncomfortable in our Kenyan home. At night, it got worse. My room was directly underneath the area the staff stayed. At all hours, indecipherable sounds flooded my room. While I was there, I was miserable. In addition to being scared, hungry, tired, and sick from my malaria medication, I experienced intense sadness and guilt. With that said, there were many moments of smiles and laughter, but I still cried every night. The women and men I met were positive, hardworking, and happy. In spite of my perception of what I thought they “lacked”, they lived meaningful, purpose-filled lives. The gentleman responsible for our stay at the hotel was so kind and sincere, yet I still felt so vulnerable and afraid. It was hard for me to accept their reality, I couldn’t get over it — I could not get over how I “struggled” with things in my life back home, where I had absolutely everything I needed and more, while these people were happily living with next to nothing. To come full-circle, I am grateful I pressed pause on teaching yoga to instead volunteer and research in Kenya. Traveling to Kenya made me the teacher I am today. Through the process of experiencing fierce, visceral emotions, I learned how to truly sit with discomfort and fear. In the moment, I was petrified. In hindsight, it is one of my most powerful, cherished memories. Through this experience, I learned the value of intense, personal struggle and of perseverance. When I arrived, I wanted to book an immediate ticket home, but instead I stayed. Staying gave me empathy for those who are scared and want to quit. Staying taught me that we are all more the same than we are different. It humbled me. And, it reminded to stay open and vulnerable because growth and evolution always happen outside of my comfort-zone. When I extend myself, I elevate to a higher perspective. This originally appeared on VuoriClothing.com. Vuori is an incredible performance apparel brand from my local community.